Before Ukraine's Security Service shocked the world by saying it had faked the death of exiled Russian journalist Arkady Babchenko in Kiev on Tuesday evening, the news of his now-fabricated demise highlighted the dangers of working as a journalist in Russia. Anna Politkovskaya was a prominent journalist at the Novaya Gazeta newspaper who was famous for her critical coverage of the war in Chechnya. She was shot dead in her apartment block in 2006. Politkovskaya chronicled the killings and torture of civilians by the Russian military. She wrote a book critical of Russian President Vladimir Putin and his campaign in Chechnya, documenting widespread abuse of civilians by government troops. Politkovskaya frequently received threats and was vilified by state media as being unpatriotic. Five men were convicted in the killing but the investigators never found those who ordered the murder, and her family blamed the government for its unwillingness to go after the masterminds. Beketov suffered brain damage and lost a leg after a brutal assault in 2008 following his reporting and campaign against a highway project in Moscow. He died five years later. Beketov wrote about corruption in Khimki, a town near the $8 billion highway. The founder and editor of a local newspaper, Beketov was among the first to raise the alarm about the destruction of the local forest and suspicions local officials were profiting from the project. In November 2008, Beketov was beaten so viciously that he was left unable to speak. He was in a coma for several months and spent more than two years in hospitals. His attackers were never found. 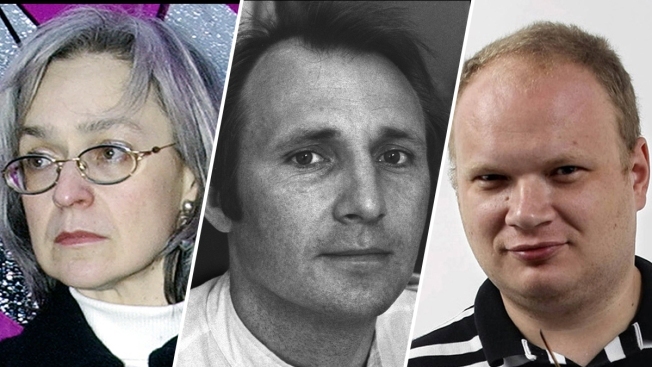 Freelance journalist Baburova was shot and killed in 2009 on a sidewalk in central Moscow as she attempted to intervene when a human rights lawyer, renowned for his work on abuses in Chechnya was also murdered by a masked gunman. Lawyer Stanislav Markelov was shot in the back of the head at close range in broad daylight by a gunman who followed him from a news conference. Baburova, who was walking back with the lawyer from the news conference, was also killed as she attempted to help Markelov. Baburova, a freelance journalist in her mid-20s, had worked for the Novaya Gazeta newspaper, also Politkovskaya's employer. Intrepid reporter Kashin was viciously beaten by two unidentified attackers outside his home in November 2010 and narrowly escaped death. He spent days in an induced coma with a fractured skull, and had one finger partially amputated. He survived and eventually recovered. Kashin has written on a wide range of social and political issues, some politically sensitive. Shortly after the attack, Kashin said he suspected then-Pskov governor Andrei Turchak to be behind the attempt on his life as a reaction to a critical post he wrote about him on his blog. Russia's then-President Dmitry Medevdev at the time pledged to solve the attack. Kashin was originally full of praise for the investigators who appeared to be trying to find his attackers, but the probe stalled shortly afterward. Frustrated with the lack of progress in the investigation, Kashin conducted his own probe into the attack and several years later publicly accused Turchak of placing an order to cripple or kill him. Turchak has never been questioned, and has denied the accusations. He currently holds a senior post in the ruling pro-Kremlin party. Kamalov, founder of a newspaper in Russia's North Caucasus critical of authorities, was gunned down outside his office in Makhachkala, capital of the Dagestan region, in December 2011. Kamalov's leading independent weekly paper Chernovik has reported extensively on police abuses in the fight against an Islamist insurgency that originated in neighboring Chechnya and has spread across the region. In 2008, authorities brought a criminal case against several Chernovik journalists under anti-extremist legislation after they published an interview with a former guerrilla leader. A court acquitted them earlier this year. Kamalov's killers were never found. Babchenko served in the Russian army and fought during Russia's two wars in Chechnya during the 1990s, first as a conscript and later as a contract soldier. He then became a journalist and worked as a military correspondent for several Russian media outlets. He has written several memoirs of his time as a soldier. A scathing critic of the Russian government, Babchenko covered Russia's war with Georgia and the separatist conflict in eastern Ukraine, blaming Russia for targeting civilians. In December 2016, Babchenko outraged many when he wrote in a Facebook post that he wasn't sorry for the military band and state television journalists who died in a plane crash on their way to Russia's military base in Syria. Several Russian lawmakers even called for stripping Babchenko of his citizenship over the comment, and Russian state media called him a traitor. Babchenko fled Russia in February 2017, fearing for his life. He moved to Kiev last fall where he worked as a host for the Crimean Tatar TV station, ATR. Ukraine authorities reported that Babchenko was shot dead in Kiev on Tuesday, and was found in his apartment by his wife. But in a shocking turn of events, he turned up alive at a news conference Wednesday, and Ukraine's Security Service said it had faked his death in order to track down people trying to kill him.